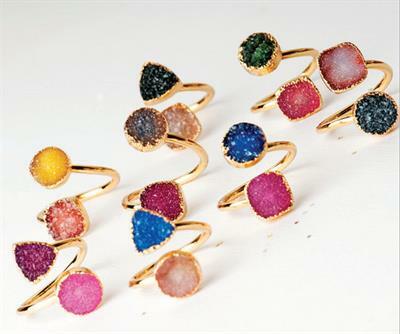 This striking ring is a part of the Druzy collection, which celebrates natural beauty with an eclectic mixture of colours and textures. Crafted from Agate and electroplated in Gold, this ring features sparkling facets and contrasting hues. Versatile and eye-catching, this ring add a splash of colour to any ensemble and is the perfect piece to welcome in summer. IMPORTANT: This ring comes in a variety of shapes and sizes. Stones are either round or triangular in shape, and a comination of blue, pink, purple or green in colour. If there are specific colours or shapes you would prefer, please leave a note in the special order comments.